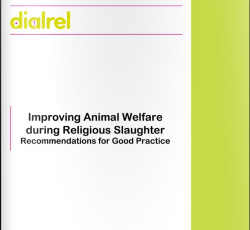 We received a copy of the comments of Pr Joe M. Regenstein on the latest version of the DialRel Document “Main outcomes and recommendations to good animal welfare practices during religious slaughter” . So we would like share them with you. Submitted by Joe M. Regenstein, Professor of Food Science, Cornell University, Ithaca, NY 14853-7201, USA. Jmr9@cornell.edu. This document remains a work in progress and still needs to address some important issues. My comments were originally put directly on the document and are now copied over. They have not been edited since the original submission. I would be happy to discuss these items with any appropriate person. Actually I’m concerned that the implementation has been hindered by the approach taken, which has left many in the religious community feeling that the project was more of a monologue than a dialogue. Only towards the end did the group even begin to engage the religious community seriously. The document still fails to be respectful of religious law and the need to work WITH that community to improve areas that don’t challenge the religion rather than an attempt to prove that religious slaughter is somehow inferior to other forms of slaughter. The lack of critical evaluation of much of the scientific literature, which has to date not separated good from bad religious slaughter remains the critical flaw in the scientific analysis. A. Why is it totally veterinary sciences and not a broader look at the issues from the multiple scientific disciplines that cover animal welfare ? B. It is clear that we don’t have a lot of scientific knowledge and a lot of it is based on an incomplete or non-existent description of the actual slaughter practices so the merit of the work cannot be judged. When scientists such as Mohan Rao or Neville Gregory respond by saying that he does not know the details of the religious slaughter, then the "religion of science" has serious problems. Some years ago the Swedish Royal Veterinary Society clearly visited the WORST possible plant in the UK and used that the justify their ban on religious slaughter. That isn’t science - that is agenda politics. A. Has each one actually signed off on this and is prepared to support everything in it ? B. That is a cop-out. A lot of the peer-reviewed literature is reviewed by people with the same belief system as those writing it. And given that none of the European slaughterhouses are close to the level of the best slaughterhouses in North America (based on discussion with Dr. Grandin), the issue of improvement of many slaughterhouses is fine. The idea that those facilities represent a base for evaluating religious slaughter as such is part of the fallacy that the scientific community has failed to address. There are bad religious slaughter houses and good ones just as there are good and bad regular slaughter houses. As long as it can be proven that the animal is alive and the actual slaughter cut is killing the animal. This is a major limitation of the work. It is disrespectful if it does not carefully consider religious requirements. How many of the authors on this document could give a systematic and complete talk on the rules for both kosher and halal slaughter, particularly respectfully discussing some of the disagreements within the religious communities and therefore providing carefully for working with each community to optimize the slaughter within the rules each community needs to operate within ? And how much of the so-called peer review literature in all aspects of slaughter, both religious and non-religious, actually describe and monitor these factors as part of any subsequent study of the actual act of slaughter. All of these items need to be done well before the impact of the religious slaughter act or of stunning can even be considered. Footnote : In this document the term consciousness is synonymous with sensibility and unconsciousness is synonymous with insensibility. Using a proper head holder has minimized the problem once a slaughterman is trained to do upright slaughter. Further work to create ergometric knives that are religiously acceptable but take into account the different positions possible for religious slaughter is needed. According to Dr. Grandin, and confirmed by Erica Voogt, there is a period of about 10 seconds when the animals is sufficiently disoriented in an upside pen that they are not agitated. Thus, ideally slaughter should be done in that time period. If the neck is washed ahead of time, then this should minimize the occasions when supplemental washing is needed and where the time to slaughter is longer than the period of disorientation. This is a good example of where understanding the religious needs (and they also are important for assuring a sharp knife) would have permitted a more sophisticated discussion. The whole issue of position of the animal at the time of slaughter would also benefit from more dialogue with different sectors of the religious community. Note : These systems are identical to those used for normal poultry slaughter and thus do not represent an additional stress of religious slaughter. This is a case where it would be appropriate to recognize the religious laws and deal with the issue of the neck preparation. Do we have any reference for how to do this properly ? How do we do the training ? With care to have a taught skin but not excessive stretching that would permit tearing before the cut. This is the type of detail that would give the document more credibility. Is the one minute also formally recognized for non-religious stunning ? This ought to have a reference. Why should religious slaughter of poultry be more restrictive than non-religious stunning since this step is identical in both cases ? A. This is wishy-washy language. The concern is that there might be pain although this has not been properly proven. Temple Grandin’s description of how the animal reacted when the religious slaughter was done right suggests that if done right there is NO pain. B. There is no recognition of the importance of the sharp knife in this situation. The whole issue of how to measure the sharpness of the knife has not received enough attention. See earlier comment on washing of the neck. This paragraph is prejudicial. Dr. Grandin has good data for cattle between good slaughter plants and bad slaughter plants with a large data set and this is the data that should be used and can be properly referenced. Just because someone did a study in a poor plant and took the worst case (which at that point is an issue of needing to put the animal down) is not a basis for making broad statements. Why are these needed — you never create a context for this discussion of brain death. The issue of a possible second cut should be addressed clearly and the requirements for such a cut elaborated. This is another area where discussion of the religious requirements of the different communities who have permitted a much more focused and respectful statement. There seems to be a question of whether the blood flow pulsation can be detected as obviously in the bleed out of poultry. This has been raised by members of the Muslim community because of the importance of being assured that the animal is alive when slaughtered halal. This seems to have been ignored in any discussion. Why is this put solely on the religious person — at that point it might also logically be done by plant personnel. The issue of why or why not on a second cut if it is obvious following the initial inspection needs to be discussed with respect to both religious and scientific issues. Is it insensibility or brain death ? How was this decision made ? So how do we know the animal is alive at the time of slaughter and that death is due to the religious cut ? Is this asking for a higher standard than used in a regular plant. There is a percentage allowed. This is given as a fact and contradicts the observations of Grandin and Voogt mentioned earlier. Why isn’t this subsumed under the bigger umbrella of doing this for all type of slaughter ? I appreciate the opportunity to comment and look forward to further work with the religious communities and scientists both in Europe and beyond to come up with a document that truly represents a respectful dialog.